A birch cabinet painted white with black glazing accents. This cabinet comes with all the upgrades you would want. In stock for lightning fast delivery if needed. 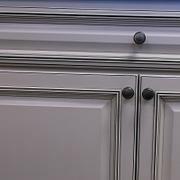 This is a elegant Knotty Alder cabinet, but is still very affordable and works great in most kitchens. 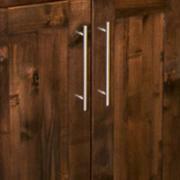 The Kodiak series of American Heritage cabinets has the look and quality of cabinets that cost twice as much. ​This is a traditional solid white shaker style cabinet. Clean and modern this will give you the look you want at a price that won't break your budget.